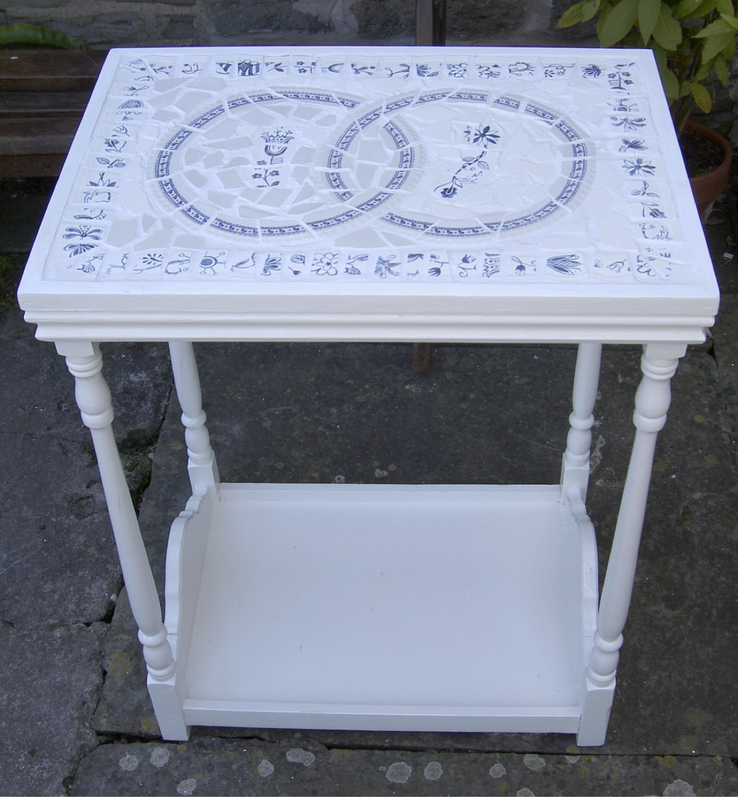 If you have an old table to renovate, or as in my case have bought one from a second hand shop just for the project, you may want to make the top from tiles or mosaic. For a change, and as a challenge, I used broken crockery for the mosaic material. 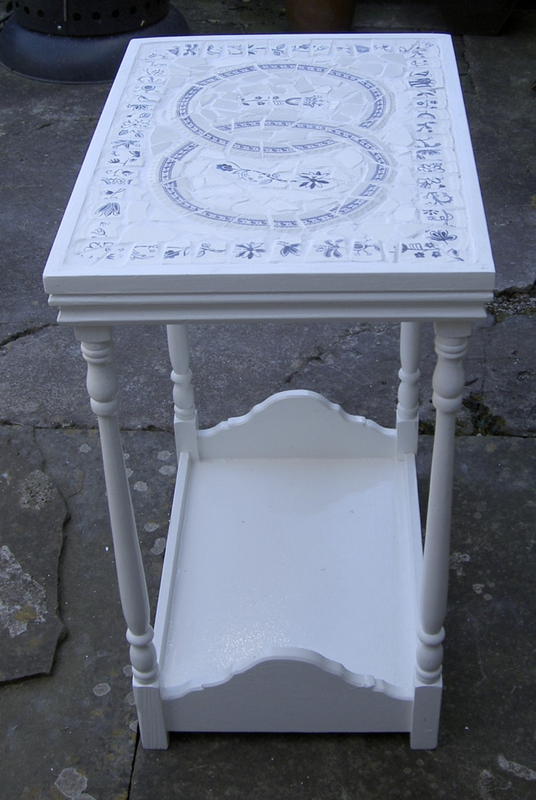 I chose a tray top table so as to have a well in the top in which to work. The plates were three we had which were all that remained of a set, any plates will do but it’ll make a neater job if you use shallow ones. To break the plates I used tile nibbling pincers, a small hammer not much heavier than a toffee hammer, and an electric tile cutter which did the donkey work. After getting each piece to the size and shape you want, use fine sandpaper on any edges which will be near the surface. Be careful, wear eye protection, and watch for razor sharp edges. The first thing to do is make sure that the table is strong, as the top will be much heavier than it was designed for. I sanded the whole thing, re-glued any loose joints (Nearly all of them), then primed and spray painted it with one of those HVLP spray guns that can use household gloss paint. I placed a tray of similar size on top and laid out the broken pieces as I cut them. You can play about with the design for a bit until you are happy with it. I was cribbing from a craft book which suggested the interlinked loops made from the rims of two of the plates so did that bit first. Putting the tray aside, I laid a bed of ordinary tile adhesive and placed the pieces of the two rings first, then the border and inset patterns, then the plain infill. You can move things about for half an hour to an hour until you are happy. I left it two days to dry as I had used a fairly deep bed, then grouted with waterproof grout. This is when you will find any sharp edges you didn’t sandpaper properly. When you find one just wipe out the grout around it with a wet sponge, sand it smooth, then re-grout.